Superheroes never have to look far for a fight in comics, but rarely do they have to fight their own creators and publishers. The Justice Society of America are now in a literal fight for their right to exist, a war to stay relevant in the DCnU. It’s a fight few think they can win, and many think they have already lost. No matter the outcome there is one thing DC cannot take away from the JSA: History. They can try, but they are in for one heck of a heck of a fight! The Justice Society of America first appeared in DC comics’ All Star Comics #3 (Winter 1940) and the team initially included Doctor Fate, Hourman, the Spectre, the Sandman, Atom, the Flash, Green Lantern and Hawkman. They were the first team of superheroes in the DCU, fighting the good fight in World War 2 and working to make the world a safer place in the years after. They grew into a true society, as the years passed they aged, had children, sought out and trained the next generation of heroes in the use of their powers. The JSA were a rare group in the fact that they had actually aged in the DCU, and with that age came years of stories as well as history in the DCU. The JSA were a family to each other, many superheroes don’t have family as losing them tends to come with the territory. They had more history and more Legacy than anyone in the DCU. 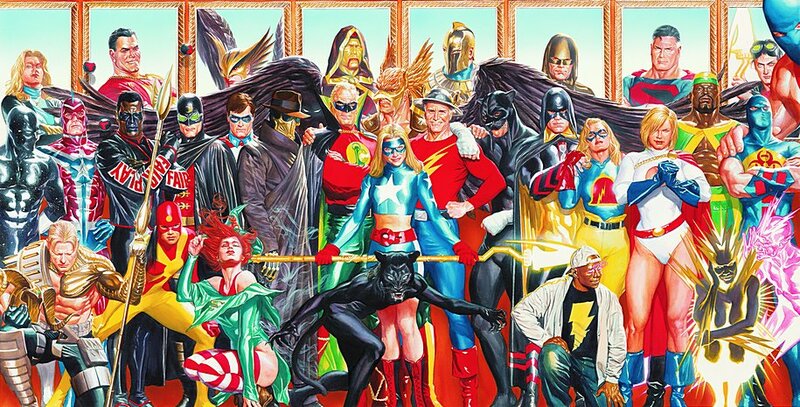 From Ma Hunkel to the Legion of Superheroes, Johnny Thunder to the Spectre, the JSA has been connected to every corner of the DC Universe for over sixty years, fighting to stay relevant when the war that first brought them together ended. In that sixty years the characters in the JSA have aged, de-aged, died, returned to life and just plain disappeared as the powers that be tried to make them relevant to the DCU. But when we look at their history, the stories they have told, the heroes they have trained, the impact they have had on every corner of the universe we can’t help but ask how are they not relevant? They are legacy, they are legends that inspired the next generation, the Teen Titans are to the JLA what the JLA are to the JSA. They are the originals, they defended the world when many of these newer heroes where still in diapers and they won’t let you forget it. Unfortunately DC has decided they are no longer relevant, and are casting them out of the DCnU history, saying Superman and then the JLA are the first superheroes and team in the universe. The problem with removing the JSA from the history of the DCnU is not just the hole it leaves in history, but the hole it leaves in those who are left behind, as well as the stories that have been told. One cannot help but wonder if DC actually has any idea how far reaching the connection the JSA has to the other heroes in the DCU, as well as the stories that have been told. We know Jack Knight was still Starman in the DCnU from interviews James Robinson gave about the Shade maxiseries he is writing, but what from Starman happened if there was never a JSA? His Dad could never have been Starman, his Dad and the original Black Canary would never have had an affaire, Phantom Lady could never have been a relative and Kate Spencer might never be his cousin. There couldn’t be a Starman legacy for Jack to take up. But it only grows from here, The Shade could never have fought Jay Garrick, negating that part of his back story, there wouldn’t have ever been an original Black Canary, there wouldn’t be a Dr. Fate. Without Dr. Fate there are changes to Day of Judgement and the build up towards Infinite Crisis. Without a Wildcat there is a hole in many fighters in the DCU’s training as he has trained Catwoman, Black Canary, Huntress and more throughout his career. There is Mister Terrific, but he cannot have been inspired by the original. There would be no Stars and Stripes, which could negate Stargirl! There would be no original Atom, thus no Atom Smasher, this leads to a flaw in the Black Adam history, he never was a member of the team, no Black Reign and this changes the events and motivations of years full of stories and adventures form the comics. The ramifications are far reaching for this series of retcons, it expands all corners of the DCU. Fandom complained when Marvel pulled One More Day and said all the stories still happened, just without the marriage, that is just one event people got irritated by. With DC there are literally dozens of major events that are now undone and that cause chain reactions for many of the heroes in the DCU. The JSA couldn’t have been involved in Zero Hour, there wouldn’t be a Hourman legacy for the Hourman of DC 1,000,000. There was no inspiration for Barry Allen to take up the mantle of the Flash, no mentor for him to learn from. There would be no starheart for Allan Scott, so it would not have been passed on to Jade and there might not be an Obsidian, this negates a large portion of the recent Justice League series that Robinson has been writing, heck without the starheart and Jade that hurts the Ion Legacy in Green Lantern as well as Jade’s role in Brightest Day. And Magog would not have existed as well if the JSA had not intervened, this puts a hole in Justice League: Generation Lost, who did Max Lord have to kill to prevent a war? What role did the (possibly) non-existent Power Girl play? Without a JSA there was no other team involved in The Lighting Sage crossover and this changes some things with the Legion of Superheroes, the ramifications are far reaching for this series of retcons, it expands all corners of the DCU. Oddly enough in recent years the JSA had grown to such a large and diverse group of heroes, we had Amazing Man, Judo Master, King Chimera, Thunder and more, there was a wide selection of nationalities for the writers to explore and expand upon. This is an interesting point to look at considering the push DC is making for diversity in the DCnU, they are tossing aside a handful of characters that they could have easily incorporated into the new books. Add into account the fact that Geoff Johns has been highly involved in the creation of these new characters, as well as his history with the JSA and we are just left with more questions about this decision. The elimination of the JSA is such a blow to the fans of the book that have been asking these questions and more of DC and gotten next to nothing as a response. Recently it has been revealed that Karen Starr exists in some capacity, be it Power Girl or the head of Starr Enterprises remains to be seen. There is some sort of history with Starman and the Shade, but beyond those two characters we really don’t know a lot and that is frustrating as fans of the character DC has printed for over sixty years. The sad thing is these are just a few examples of the JSA’s impact. If you look back through the stories that have been told, the motivations for the characters, and even simple supporting roles the JSA has played throughout their existence, you can see an ever growing gap in the history of the DCU. The history of Captain Marvel has been changed, the Legion of Supeheroes have been affected. The history of the Spectre and Dr. Fate have been changed, entire events may have been altered by this, Infinite Crisis, Final Crisis, Brightest Day, Zero Hour, 52, the list goes on. DC has some explaining to do and I do not envy the person who has to try and figure out how these events all line up. Until then its going to be war between the fans and the editorial department, which is kind of fitting if you ask me.